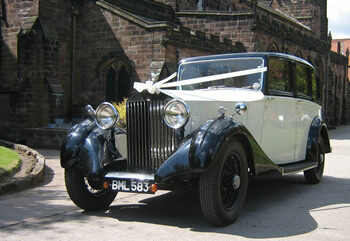 We are a small family business that has been providing wedding car hire service in the Cannock area for over 20 years. At Aaron's Wedding Cars we only take one booking per wedding car per day, so if things run over it's never a problem and always a pleasure. Our chauffeurs have a smart, polite and will tend to your needs while they are with you from the moment the car arrives until the time you and your photographer has finished with them. All our cars are at one location in a well lit garage, with plenty of room to view and try them out to see if they meet your needs. The cars can be viewed at most times by appointment. They are also cleaned and polished before every wedding, ensuring they arrive to you in a spotless condition. The cars also come with ribbons and bows of your choice and with parcel shelf decorations. The also carry large, white umbrellas. 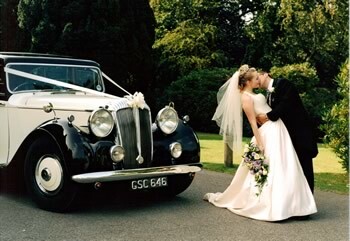 All Aaron's Wedding Cars are of the same colour scheme, so they even pair up very well and never look out of place. No two weddings are the same, so we are always happy to discuss your individual needs. We are more than happy to do more than one trip in and out of the place of marriage, mileage and time permitting, with one car. We don’t have a mileage or time charge but we do only cover certain areas. Our 1934 Rolls Royce 20/25 Park Ward bodied limousine is the final word in elegance and grace. Our 1948 Vintage Daimler DE27 Hooper bodied limousine is a refined and elegant car. Perfect for any wedding. 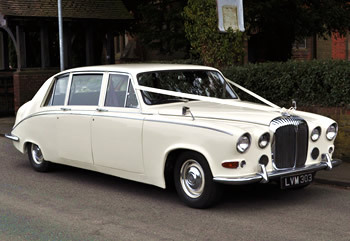 The coach work of our 1971 Daimler limousine is furnished in old English white, whilst the interior is trimmed in grey leather. Copyright © 2014 Aaron's Wedding Cars. All Rights Reserved.